Several of the people interested in adopting Monte asked if he was good with cats, so we tested him today. 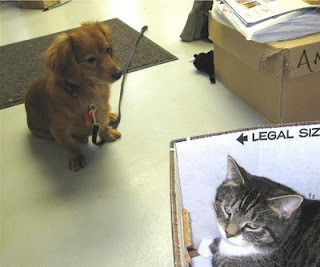 Using our faithful cat tester, Missy, we let them meet with Missy safely inside a dog crate. That went well, so we let them meet with Monte on a leash. He was far more interested in meeting Missy than she was in meeting him, but she clearly thought he was no threat. They spent quite a while loose in the lobby together, and later Missy was seen eating out of Monte's dinner bowl!